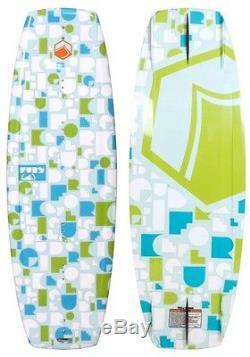 Brand New Liquid Force Fury Kids Wakeboard. 120cm- Fits 40 to 85 lbs. Most wakeboard manufacturers' put very little thought into their youth offerings, but the Liquid Force. Fury Wakeboard is certainly an exception. Each size has distinct measurements and gradually increased rocker angles to cater specifically to the progression of young riders. With 6 fins total and concave beveled rails, the Liquid Force. Fury Wakeboard creates a stable and forgiving ride that glides smoothly through the water while minimizing the risk of catching an edge or having the board slip out. Smooth, fluid and exceptional carves. Predictable ride and flowing transitions for a high arcing pop. 3 (1 Stiff - 10 Flex). DISC Hull Through the Center. DISC (Double Inside Single Concave) softens landings and maintains faster board speed as water flows out of the hull. Lifted edge through the center to prevent catching. The sharper rail at the tip and tail for improved control and response. Molded in, Warped Long Based Side Fins. International Buyers (there may be custom or duty due on arrival). The item "Liquid Force Fury Junior Wakeboard 120cm fits 40 to 85 lbs" is in sale since Tuesday, November 29, 2016. This item is in the category "Sporting Goods\Water Sports\Wakeboarding & Waterskiing\Bindings\Waterski Bindings". The seller is "adrenalinewater" and is located in Woodinville, Washington. This item can be shipped to United States, Canada, United Kingdom, Denmark, Romania, Slovakia, Bulgaria, Czech republic, Finland, Hungary, Latvia, Lithuania, Malta, Estonia, Australia, Greece, Portugal, Cyprus, Slovenia, Japan, China, Sweden, South Korea, Indonesia, Taiwan, South africa, Thailand, Belgium, France, Hong Kong, Ireland, Netherlands, Poland, Spain, Italy, Germany, Austria, Russian federation, Israel, Mexico, New Zealand, Philippines, Singapore, Switzerland, Norway, Saudi arabia, Ukraine, United arab emirates, Qatar, Kuwait, Bahrain, Croatia, Malaysia, Brazil, Chile, Colombia, Costa rica, Dominican republic, Panama, Trinidad and tobago, Guatemala, El salvador, Honduras, Jamaica.